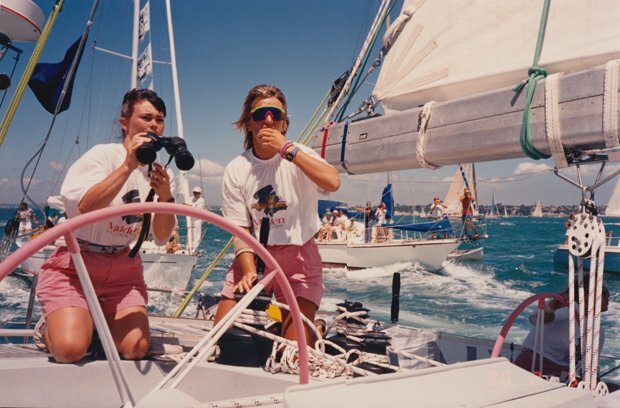 Yachting journalist Bob Fisher famously referred to the first all-female crew who entered the Whitbread Round the World Race in 1989 as 'a tin full of tarts,' such was the media condescension and sexism towards these brave women. Fisher is interviewed in talking-heads fashion, alongside other chauvinist detractors who bet against their victory, and the crew themselves. The women, of course, proved them wrong and documentarian Alex Holmes takes the viewer on their thrilling voyage, not only across stormy seas, but on a journey to shatter the sport's glass ceiling. The focus is on skipper Tracy Edward's extraordinary determination and, curious as to where that came from, Holmes travels back to her childhood for answers. Seeing her mother fail in a male-dominated business after taking over from her father, who unexpectedly passed away, seems to be a turning point for her. These personal events led Edwards to eventually drop out of school and run away from home. She found a new family when she took a job as a stewardess aboard a boat and her love for the ocean was born. As Edwards talks over archive video from the 1980s, you feel her passion and personal conviction. The footage and interviews are edited together in a skilful manner that immerses you in the high-stakes and emotion of it all. It sets the scene and, with a firm grasp of the era, allows you to fully see what kind of obstacles these women were up against. With the glory came heartache and stark realisations but also a sense that they were really making a difference. And, as the crew talk you through the rivalries, financial risks and perils of sailing on choppy seas, it's difficult not to get swept up in the drama. Limited release from Fri 8 Mar. Documentary about the all-female yacht crew that entered the Whitbread Round the World Race in 1989, focusing on the life of skipper Tracy Edwards. The footage and interviews are skilfully put together, immersing the viewer in the high stakes of it all and showing what obstacles the crew was up against.